A couple weeks ago, Angela introduced us to, and gave two lucky Muffin readers a chance to win, the Writer's Digest Guide to Magazine Article Writing by Kerrie Flanagan. Angela had all kinds of wonderful things to say about Kerrie and her book, including that Angela was lucky enough to write the foreword. Let me tell you, after reading this book, it really is as good as Angela said. Kerrie did an outstanding job on covering everything you need to know about magazine article writing along with personal essay writing and writing for online publications, too. What I really love about this book is that I consider myself pretty well seasoned in writing for magazines, newspapers, and e-zines, and I still learned so much in this guide about organization, etiquette, finding ideas, research, and more. This book goes step-by-step into the process of what to do if you want to get published in a magazine. Kerrie shares her own story, after Angela's informative foreword about her experiences, and then Kerrie gets started with how we go about finding ideas. She shows you how to take big ideas and make them into something editors might want to publish as well as using ideas from your own life. My favorite chapter is the next one which is Chapter Three, "Studying Magazines." This is something that I have always done and have preached at writing conferences to do. But what I love about Kerrie's chapter is how she breaks it down into manageable steps. For each publication you're interested in, you need a handle on the reader, the style, the types of articles, the writer's guidelines, and what articles have been recently published. She gives several real-world examples to explain her points (in all chapters, not just this one). After this, she writes about the next steps, such as the query letter, your contract and rights, and actually writing the article. 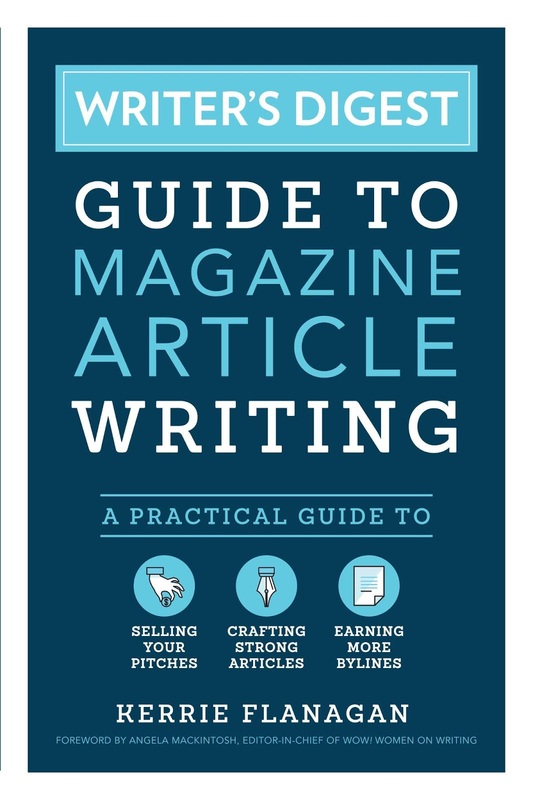 Another great thing about this book and the examples is that many of them are also information that you need to understand how to write for magazines. For example, in the chapter on query letters, Kerrie includes an example of a Q & A article. This article is with the former children's magazine editor, Marilyn Edwards; and in the example, Marilyn gives great advice for writing queries. In other words, the examples in the book often provide information for writers as well as an example of what Kerrie is describing. I could go on and on, but as you can see, I highly recommend this book to beginning and advanced freelance writers. There's something in here for everyone! One last thing I will mention is that Kerrie has several experts whom she quoted in the book from freelance writers to editors. These sections were also some of my favorites because there's nothing like learning from those who are in the trenches day in and day out. 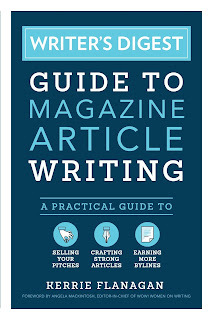 So hurry now and grab Writer's Digest Guide to Magazine Article Writing. You won't be sorry. Margo--It DOES sound like a good book. I was hoping I'd win. It really is! And it's not one of those that you really have sit down and read straight through. I know you write and publish a lot of personal essays. So you could start with the personal essay chapter, for example. There's also a chapter I liked, that I forgot to mention above, on writing articles that promote your book, but not in a sales way. For example, if you write historical fiction for kids ;), you might want to write some articles around that time period for Highlights or an educational magazine market. You are building your "historical fiction writer" platform with articles published in magazines for your audience (kids, teachers, parents) with hopefully the mention of your book in your bio! Oh crud, Margo. You're selling it in an even more enticing way. I said "Oh crud" because I have bought so many books this summer, the mailman and the UPS guy stop by for a snack and a beverage when they come by. Sioux ~ Omg, that's hilarious! I have to admit, I have such a book fetish that I buy a few every week, even when I don't have time to read them. I just want them in my library. Yep, I'm totally a book hoarder. Hahaha, Ang and Sioux, the other day I took a picture of the basket of books by my bed and put it on WOW! 's instagram page and asked for photo captions. It's a true problem for so many writers! Thank you SO much for the wonderful review. I am thrilled to hear that even a seasoned writer like yourself found it helpful. I wrote this book to provide writers everything they need to start writing for magazines and give veteran writers some new tips they may not have thought about before. Thanks for the continued support and kind words about the book.